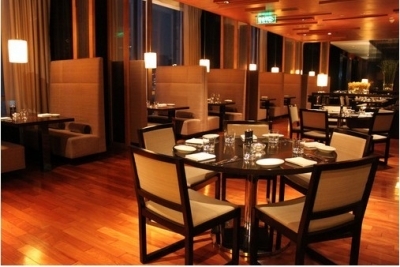 Located at the 22nd floor of the Grand Hyatt hotel in Guangzhou, the G Restaurant is a western cuisine eatery that offers the guest a high quality service situated in contemporary surroundings. Depending on where you are seated (and if you are lucky to have a seat with a view of downtown Guangzhou), the views can indeed be stunning- especially if you are exposed to the night time views of the Tian He district with the Citic Plaza in the background. The dessert was the “Classic Crème Brulee with a generous scoop of Chocolate Ice-cream blended in neatly with a few drops of Mao-tai’- priceless invention by the chefs’. It’s hard to argue about the taste when you are presented with a genius dish such as in-house made chocolate ice-cream blended in with a dash of Mao-tai, or how about a ginger flavored ice-cream (you’ll definitely be surprised what you can get in China). The “G” runs a special buffet lunch for 168RMB per head- mainly targeted towards the local business clientele but is easily affordable for even those on a local Chinese salary. It’s a reasonable price to pay for the high quality of the luxury service and food. Food has always been taken exceedingly seriously in Guangzhou, and you just end up wishing that there were more “G” style restaurants and bars in town.